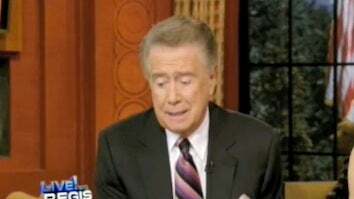 After 23 seasons, 79-year-old Regis Philbin announced he's retiring. Given his age, this isn't exactly shocking, but it does mean we're losing the last host who filled the "everyman" role without being a personality-free automaton. We're looking at you, Seacrest. Younger viewers may know Regis mainly from Who Wants To Be A Millionaire and clips of his cantankerous outbursts on The Soup, but throughout his long career he's displayed a talent that many younger hosts lack. He isn't the most hilarious or charming man on TV — in fact, plenty of people find him intolerable. But with roughly 60 years' experience hosting various talk and game shows, Regis has established himself as a personality who can be affable and amusing without actually outshining other stars. You don't expect him to make a joke at a celebrity's expense like one of the late-night hosts. And he won't reduce anyone to tears like Barbara Walters. But he will throw in a few witty asides while a star's blathering on about her latest CW show, making said blathering a bit more entertaining. This may be why he's one of the last remaining men on a daytime talk show; his cranky-yet-lovable grandpa routine is easily digestible even when people are only half-awake. While many of his successors seem to be shooting for a similarly inoffensive on-air personality, sadly that usually comes across as no personality: Ryan Seacrest, Billy Bush, the dude from Sugar Ray and Mario Lopez (it's been nothing but downhill since Slater and Louganis). They're all practically identical, save for Seacrest being far more wealthy than the rest — and this is because he has become the the entertainment everyman for the new TV generation. Alas, he's accomplished this by being stunningly generic. He's good at staying on script and dutifully inquiring about celebrities' latest projects, but there's no Seacrest version of the shouting "Regis voice" or ridiculous, wide-eyed outbursts (though Joel McHale regularly impersonates Seacrest, it mostly amounts to Regis-is-short jokes.) When we chuckle during a Seacrest interview, we're laughing at him, not with him. Boring. Live With Regis and Kelly will continue with Kelly Ripa and a new co-host — ANDERSON COOPER HELLO — but regular fill-ins Anderson Cooper and Dr. Drew have both announced they're rolling out new daytime talk shows next year. And certainly AC and Drew have personality, but neither have the slightly crazy Regis je ne sais quoi. His departure still marks the end of an era for a certain type of host/interviewer. He may be the last male TV host to master the art of making viewers comfortable without being catatonic.